Adaptation of Matrix’s PBEM++ system." "Well... $39 gets you... 72 cans (12fl.oz) of Milwaukee's Best in WV (at least when I was there), excluding the pills for reducing acid reflux. Now, seriously. The additional features (see Bob's reference) are more than worth it. As for me, I don't care about the UI; I want the inner works (under the hood?!) to be better than those of its predecessor. And they are. 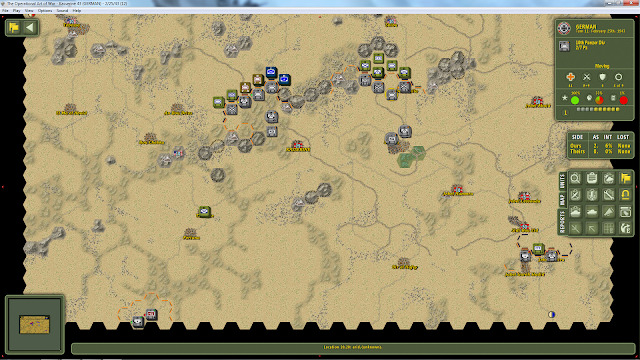 If I compare how the AI acted at my Tutorial '41 and now...woooo! The friggin' bugger even gave me a hard time! 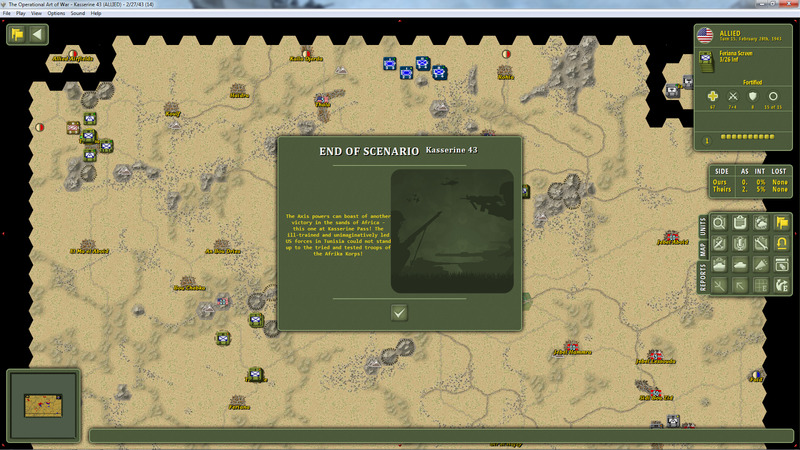 And I created the scenario to be a... walkover? As for me; I rather skip heartburn after 72 cans of MB's :)"
To understand my take on the game, you have to know two things. 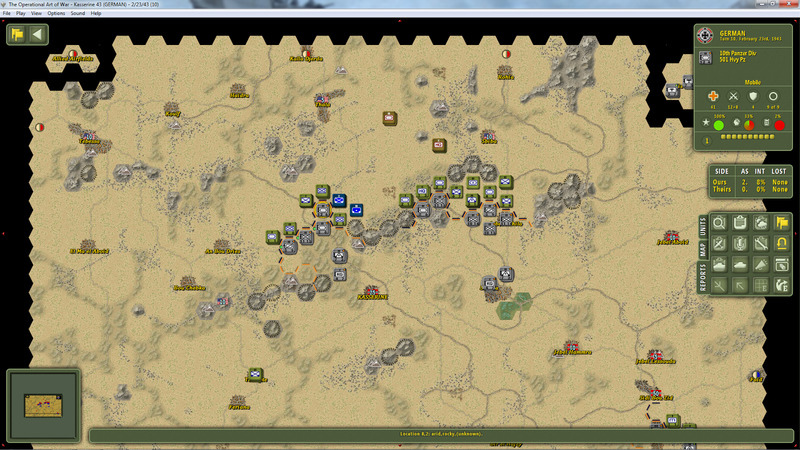 I really have no interest in the North African WWII campaigns at all, and especially the later Tunisia campaign. I have read about both, but neither, especially the latter, has really caught my attention. For no particular reason, I fired up the 'Kasserine 43' scenario from the first screen. To be honest I was overwhelmed by the amount of the other scenarios to choose from. 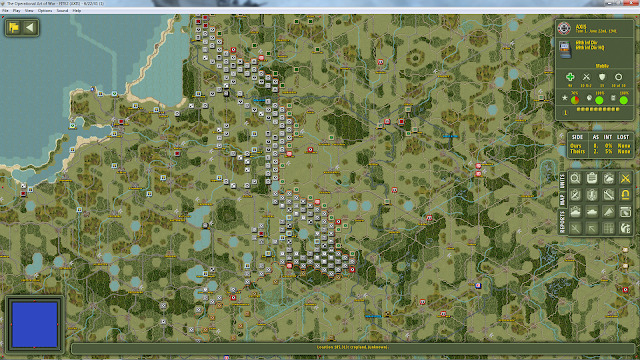 I fully expected to play one or two turns and then switch to a WWI scenario. The UI changes and the whole game presentation seems to be different in a new and exciting way for the better. I am now on the eighth turn of 'Kasserine 43' and I couldn't be more engrossed or happier. I have owned every iteration of the game that has been released. I have also played board wargames since the 1960s and computer ones starting in the very early 1980s. 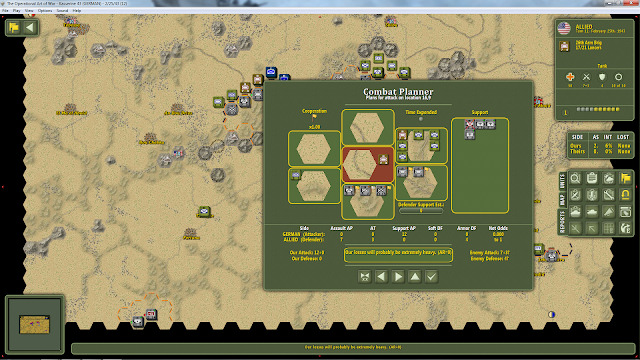 I have not been so engrossed by a pure wargame in many a year, and never by a scenario that I don't even enjoy reading about. 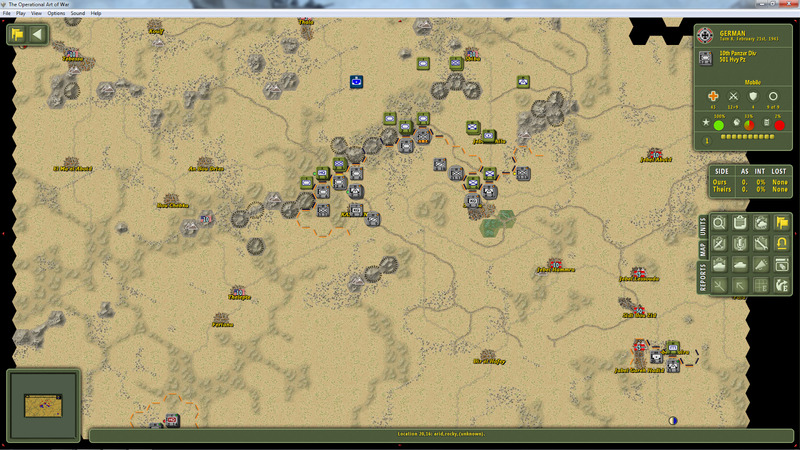 I have taken Kasserine, and with four turns left I have an overwhelming victory, but the Free French and now the English are coming in as reinforcements. I think I have shot my bolt, and now I need to hang onto to the different victory point hexes I have. Just as in history, the Kasserine attack was really just a spoiling one, and never had the forces needed to turn it into much more than that. 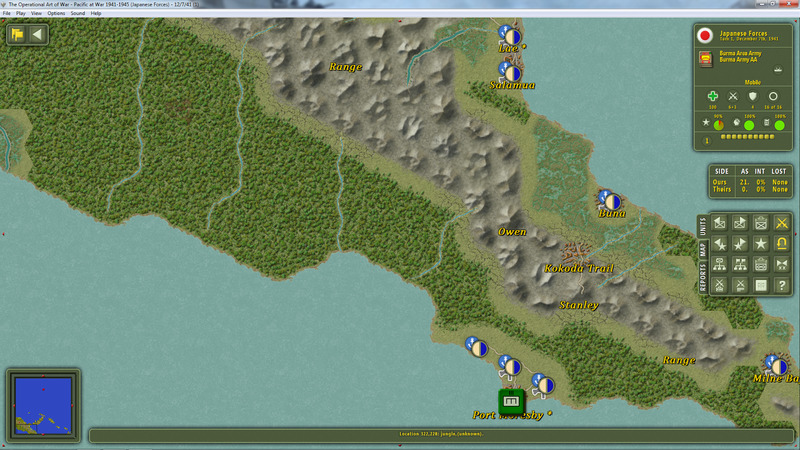 I am pretty sure that my forces are now heavily outnumbered and even if I win this fourteen turn scenario, it will not really change the campaign one bit. I have no intention of wasting my troops with an attack, but I wanted to show the 'Combat Planner' screen. It is a godsend, and feels like having a chief of staff to turn to. So my first fully played through game/scenario about the North Africa campaign is over. The Allies in the end did not have the overwhelming might I thought they would have, but still I was on the defensive. In this day and age where every minute of our lives count, it is still amazing to me that this game pulled me into a historical campaign that I never read about anymore. My gaming is almost always commanded by my reading. I read about a particular historical campaign, and then open up a game that deals with it. What might get the book publishers happy is that I am thinking of picking up a book about Kasserine. For a game to be able to have that impact, and not the other way around, is pretty amazing to me. 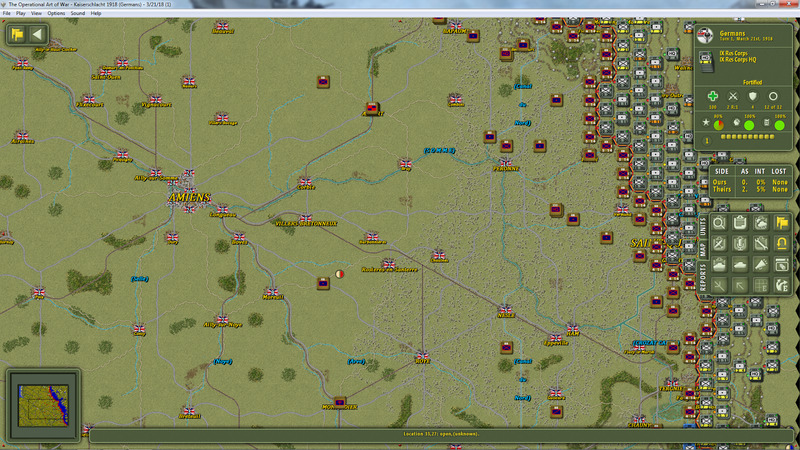 This is a shot of the above scenario's bigger brother 'FITE II'. 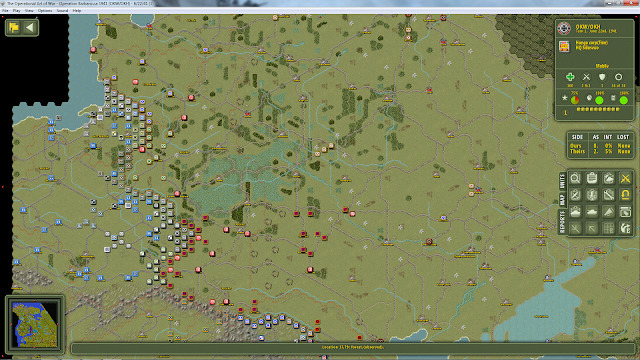 Fire in the East is the monster of monsters eastern front scenarios that comes with TOAW IV. Please, someone work on getting this beauty an AI. 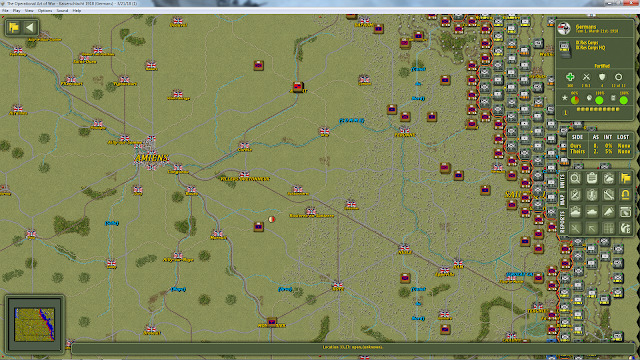 This is a screenshot of one of my favorite scenarios, the 1918 German offensives. This is a zoomed out shot of the Pacific War at 25 km per hex. 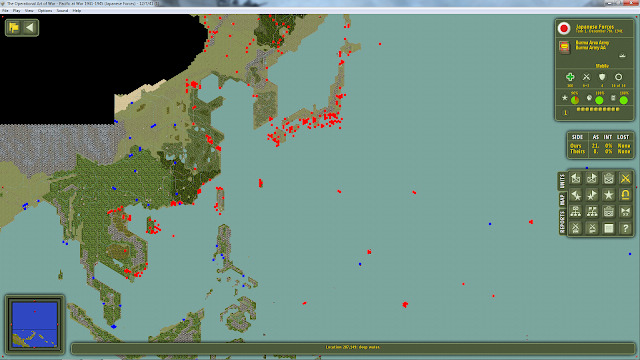 This is the same scenario zoomed into New Guinea. If you have never bought into the franchise, now is your time. For less than dinner with a friend, you will get enough gaming greatness to last a lifetime. For those of you like me who have every single one of the TOAW games and the old manuals it is well worth the money to invest again in the games future. I haven't even touched upon the new and vastly improved naval warfare. This part of the game has made Pacific Ocean scenarios and Mediterranean ones actually enjoyable. The AI in all of the scenarios I have tried seems to play much harder than I remember. The dedicated team that worked on updating this already great game to the level it is at now should be congratulated. I, for one, say thank you.